Hey guys! It's been a month since the last time I published a post. It's the biggest break I took from the blogging in a while! I missed it so much. My schedule was super busy from work and studying. I'm back now and you can expect a lot of interesting content. I finally managed to shoot together with my blogger bestie Jelena (from the blog Beautyfineprint). We did a shooting for new Trend collection by H&M. We love working together soo much! A few months ago, we did a shooting for H&M, so it's not our first time shooting it together. You can check that post here. I love how it's slowly becoming a tradition! For this collaboration, I decided to go with this beautiful oversized houndstooth coat. I love houndstooth pattern so much! I wore it last season and I can't believe it has become such a huge trend right now. You can see it everywhere, from coats, suits, to shirt and skirts. Everyone went houndstooth crazy. I love the fact that the coat is so masculine and it looks like you stole it from your boyfriend. It's effortlessly beautiful. You can wear it with absolutely everything. 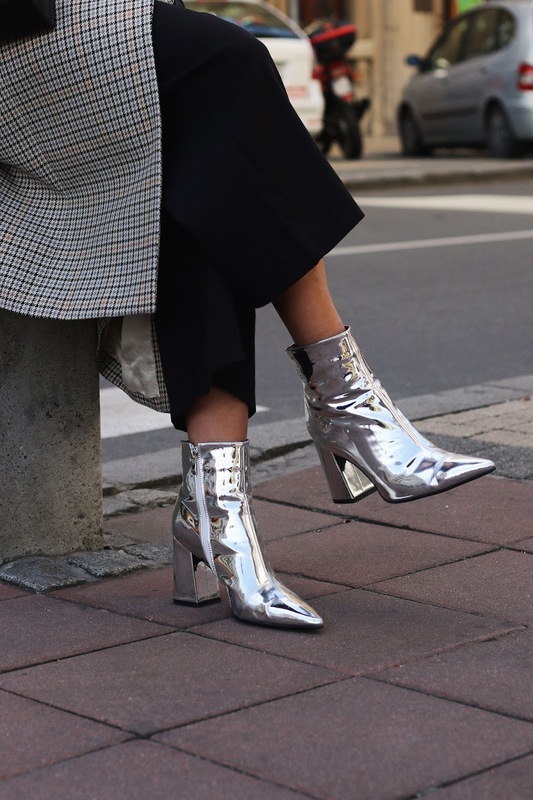 I had to style it with these metallic boots from Ego. They have the craziest range of ankle boots out on the internet for such a great prices. Don't forget to check them out! I wanted to show you how you can rock this coat with simple pieces and to still make it look amazing. I think that red turtleneck goes perfectly with a pattern on the coat. I decided to go with wide leg pants because it's a bit fancier look. For an everyday look, I would definitely choose jeans, turtlneck and flats. I'm so happy that I have a chance to work with H&M. Through working with them I realized how much they are giving into it. They have few collections that are constantly changing (Trend, Divided, Conscious, Studio) and once a year they make a collaboration with big luxe brand. This year they created a collection with Erdem and I'm super excited for it! They have a team of designers who are constantly working on new lines and clothes. It's not like they are just copying big fashion houses. H&M is available for everyone, you can find cheap clothes and you can find more exclusive ones for higher prices. I love that about H&M! Did you like outfits that we came up with? Don't forget to see closer how Jelena styled blouse from latest Trend collection by H&M. You both look fab! I love how you styled both outfits with the fun accessories. So stunning! Love your style! Super nice outfits, I particullary like the coat! You ladies look like you just walked out the pages of Vogue. Love the one shoulder button up and the platinum booties. You look great and the accessories are on fire! I absolutely love your jacket and both of your looks! Your Topshop shoes are amazing ! Your coat looks so classy and I like it. But the white blouse looks so gorgeous new style of blouse. It's fun how styles keep coming back. The old is new again. H&M is doing a great job of bringing styles back in! I love H&M and the houndstooth pattern is a classy favorite. Seems to be at a great price! Such trendsetters and what great pics. Love it, good job on this one! Great outfit, you're so beautiful.